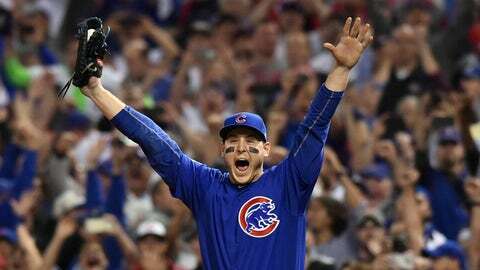 CHICAGO — What does it mean for the Chicago Cubs to win the World Series? “Everything” doesn’t seem like enough. The Cubs not winning the World Series was a constant in this city for more than a century – it was part of the cultural fabric. The hope of spring and the fun of summer always gave way to disappointment — or worse, pain and misery — as temperatures dropped and winter approached. It was a dependable cycle. It explained a lot about Second Citizens. The venerable ballpark on the North Side didn’t house winners, but it was OK — people were so used to it, you could still have a good time anyway, so long as the weather was good and the wind was blowing out toward the lake. But on a wet night in November — the kind that would perfectly fit the typical mood of the season — there was celebration and happiness on the streets of the Windy City. The Cubs didn’t make it easy — no sir — but it had to go that way, didn’t it? The Cubs had to blow a three-run lead late in the game. They had to test fate one more time. They had to end up in extra innings, and the universe had to provide 17 minutes of rain delay to think about it before the extra frames could start. It had to be as excruciating as possible, because baseball is cruel and the Cubs are — make that were — the living manifestation of those intentions. Cubs fans had to be reminded what it’s like to suffer one last time before the celebration of a lifetime. But once the excruciating delay was over, Ben Zobrist delivered an RBI double in the top of the 10th inning. Then Miguel Montero added another run to the board with an RBI single of his own. And when the runs finally stopped crossing the plate, Carl Edwards Jr. and Mike Montgomery came in and registered the final three outs. Cubs 8, Indians 7. It’s going to take a long time to get used to the new reality of things around these parts, but it’s a challenge that Chicagoans and Cubs fans from around the world will have no problem taking it on. No one knew what it would take to lift the Cubs to a World Series win — what kind of team you’d have to build to overcome 108 years of futility and the pressure that goes along with it. So the Cubs' front office went out and built what was unquestionably the best team in baseball. Even then, winning the World Series was no sure bet. The Cubs entered this season with high expectations and plenty of skepticism. For any other team, it wouldn’t have sounded so strange — it wouldn’t have been such a hot take — to say that they could win the World Series, but it was always stated with whimsy or strangeness. It didn’t hit the ear right. The Cubs’ march to the postseason only added to the skepticism, not because they weren’t worthy — far from it — but because no one could believe the Cubs (the Cubs!) could be that dominant. The postseason is a different beast than the regular season all together, but the Cubs showed that they had the magic necessary to succeed in October with dramatic series wins over the Giants and Dodgers, clinching the team’s first pennant since 1945. But it appeared that the Cubs’ luck had run out in the World Series. Attribute it to whatever you want — no one can ever prove, and no one in the Chicago clubhouse will ever admit, that the pressure was getting to the team — but the Cubs fell behind a dynamic, headstrong and scrappy Indians team 3-1, entering Game 5 at Wrigley Field as a near-dead entity. The pressure was off because the Cubs were written off — only five teams have ever come back from a 3-1 deficit to win the World Series and only three had completed the comeback the last two games being on the road. The Cubs were not going to be one of those teams. That didn’t jive with the Cubs’ history. Order was surely going to be restored — the Cubs weren’t going to win the World Series. But Chicago was set up for a comeback — it came back from an early deficit to beat the Indians in Game 5, forcing a return trip to Cleveland, and then pounded Josh Tomlin, who was working on three days rest in Game 6. It all came down to Wednesday’s Game 7, and the Cubs, riding a wave of momentum and adrenaline from overcoming the near-death experience squared up Indians ace Corey Kluber — who was also pitching on three-days rest — for four runs in three-plus innings, giving them a cushion they thought they could ride to the finish line. 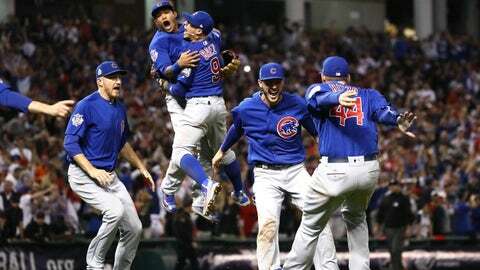 The game had a dozen seminal moments before THE moment — Dexter Fowler’s leadoff home run, the first in a World Series Game 7; Javier Baez’s chasing of Kluber in the fourth inning with a homer of his own, breaking a wicked slump and making up for two errors in the contest; Jon Lester pitching out of the bullpen on two-days rest; and the granddaddy of them all: David Ross’ home run to make the score 6-3. And then, they choked it away — they were dead again — only to rise once more. And so we’ve reached a confounding new reality — the Chicago Cubs are the champions of baseball. The Lovable Losers are the undeniable winners now, and there was not an ounce of fluke to the victory (though surely Cubs fans would have gladly accepted that reality as well). This Cubs team might not go down as one of the great teams of all time — though they really should — but they will certainly be one of the most memorable in the history of professional sports. It’s memorable not because of their splendid play or cheerful demeanor — they’re memorable because of what they were able to provide. 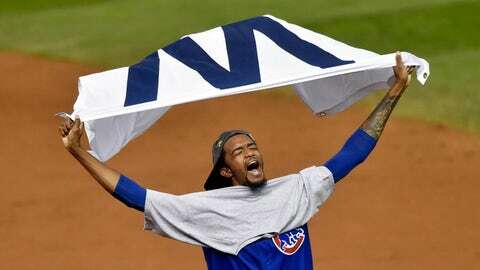 Cubs fans hung in with those lovable losers their entire lives — for generations, even — despite having another team in town, because they believed, deep down, that a moment like this would happen. Even if they didn’t want to admit it — didn’t want to get their hopes up with hype — they believed. And more so than that, they wanted to be part of this moment. They wanted to be part of the biggest event the city of Chicago had seen since the fire. That moment is here, and it’s going to last a long, long time.